So, we've ended up with something of a variation on what we'd used in the past, but it works for us. To start, we each carry a daypack - mine is around 30L, Ann's is 28L, both from Patagonia - with things we need on travel days or exploration days as well as important docs or electronics we want with us at all times. The kids carry small backpacks (REI Tarn 12) with at least water bottles and a few stuffed animals. Then, we pack into two expedition duffels, at first it was a Large (95L) and a Medium (71L) North Face Basecamp duffel I've had for about 20 years, but more recently we've continued the Patagonization of our lives with two 90L Black Hole duffels. 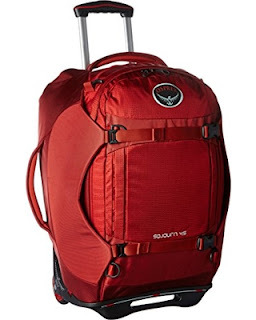 A luggage total of 180L means 45L per person (not including backpacks) which is very comfortable for travel in any season, but the backpack straps on the duffels mean that in a pinch, we can each grab one and get moving. That being said, we mainly move them using two folding luggage carts (we have these, but they're a little narrow/tippy so are going to try these wider ones). So why not buy the wheeled version of the same bag? Because this way we can dump the big bags at the check-in counter and strap the carseats - sometimes with kids *in them* - to the carts to move through security and through the terminal. At the gate, we put the seats and folding carts in gate check bags (we love these) and stroll onto the plane with just what we need. The other advantages of the non-rolling duffels are the previously-mentioned backpack straps and the fact that they can pack away to almost nothing if we're moving into a van or motorhome somewhere. Note that when we need to move *everything* at once, the carseats do strap - if a bit precariously - inverted onto the duffel bags on the carts. So with all that in mind, I leave the review below for anyone to check out. One of the bags I look at below still may be perfect for a single person or couple or for someone for whom the carry on only approach is a little more doable. To see some pics from the Iceland/Europe trip and see our system in action, check out the stories. Over the years, we’ve packed in a lot of different ways, into motorcycle side cases to ride high Colorado mountain passes on the TransAmerica Trail or from Nice to the Pyrenees and back along the spine of the Alps, into an SUV to cross 8 borders in Mexico and Central America on the PanAmerican Highway and into an Airstream trailer for 2 years on the road, that time with two kids and a dog along for the ride. 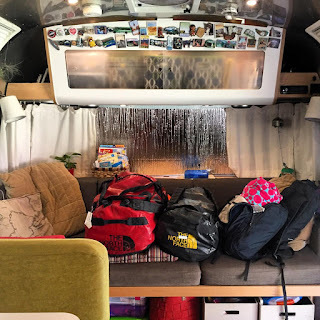 Each time, the requirements - comfort, convenience, weight, cost and yes, aesthetics - have been unique, but the one thing we’ve learned from the successes and failures we’ve had along the way is that before you can decide what you can pack, you first need to decide how you would like to travel. On our first motorcycle trips, we packed way too much, and at the slightest variation from the perfect center of balance, our top-heavy mass would begin an irreversible, slow-speed lilt until the bike would come to rest awkwardly on one of the hard side cases. 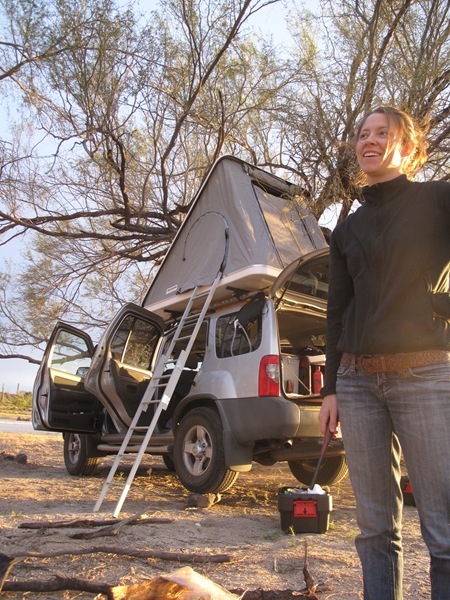 When we pointed our SUV south, we were loaded down with such “unobtainables” as spare AA batteries, motor oil, and duct tape, only to find that we’d pass a few Walmarts a day on our journey through Mexico where could be found those items and anything else we could possibly think of. After upsizing our Airstream to 25 feet in anticipation of hitting the road full time after the birth of second child, we let ourselves be convinced that we needed nothing less than a double cab, diesel monster truck with a high-rise cap to haul the trailer and pack everything we wanted to bring. Turned out, we hated driving it and ditched it after a few months. It meant jettisoning a few things, but we were much happier in the end. Since having kids, our travel system has been to pack the entire family into large checked bags and to carry a couple day packs with what we need for the day. This actually works quite well when we know roughly what we’ll find on the other side of a single flight, even though it does usually mean that I’m the one with the large North Face Basecamp duffels weighing 49.875 lb (the hardest part is keeping a bag this big under the magical 50lb checked baggage surcharge weight) strapped to my back like a Himalayan porter as we wander around looking for the taxi stand. We’ve also traveled with an XL Timbuk2 CoPilot roller bag and/or a folding luggage cart for the carseats, but either way, we’re both still carrying backpacks and only have our hands free to varying degrees. On our upcoming trip, we’ll spend almost 10 weeks driving a camper van around the Ring Road in Iceland, wandering around Amsterdam and Paris and then exploring the coast of France, Spain and Portugal and stop over to visit family on the east coast for Thanksgiving before returning home. The plan is to spread our stuff out into smaller bags to take advantage of the carry-on allowances of each of the tickets we’ll be buying for the kids. Carry-on bags will save some money over checked bags, minimize customs hassles and baggage claim delays and confirm that if we can carry them onto a plane, we can carry them 10 blocks in search of a croissant before the kids melt down. We’ll be looking for 2-3 bags, possibly two carry-on sized backpacks and a carry-on roller bag that the car seats could be strapped onto, that will allow us to move smoothly between campers, AirBNB’s, pensions, planes, trains and rental cars, all while lugging two car seats and holding the hands of a (then) 6 and 3 ½ year old. Since carry-on sized roller bags are fairly common, our main challenge will be finding the travel backpacks, but in reality, our requirements for both are the same. Free returns through Amazon Prime and Zappos can be a dangerous thing, but they allowed us to order several bags - all of which meet the above requirements, with only minor exceptions - and compare them side to side. Of course, we’re only evaluating these bags for our specific uses and tastes and your needs or aesthetic may very well differ. I had three big problems with this bag. The first was how you pack it. We’ve been using packing cubes to organize our clothes and as a way to set limits on packing for years, but even with the cubes, as soon as the bag is opened, everything flops out. Minaal recommends packing into “the scoop,” the curved front flap of the bag, but even when opening the bag in the counterintuitive way with the backpack straps facing up, the lack of structure in the flap means that it just collapses, leaving your stack of cubes to tumble. Two built-in pockets in the back section do provide some organization, but if they’re overpacked, it’s even harder to close the bag without your cubes sliding out the side like wet tomatoes on an over-mayoed burger. The second issue is with the exalted tech area. Now this may just be that it didn’t fit my needs, but there’s just too much space and efficiency wasted on the impressive suspension that keeps your 17+” laptop and tablet several inches from the sides and bottom of the bag. In addition to making these devices a little tight to get to, especially when the bag is fully packed, the very limited "office pockets" are also centered in this compartment, meaning that spare batteries or a portable hard drive, if you could squeeze them in in the first place, would be crunched right against your fragile screens. And all this to prevent a clumsy baggage handler from dropping the bag, which is part of the point of having a carry on in the first place. Finally, there are just a few small external pockets, and those are without any organization. Two at the top and one at the bottom (which holds the conveniently included rain fly and separately purchased hip belt) plus a really small one inside the tech sleeve. There’s just nowhere to stash a sandwich and drink you picked up in the airport or to cram a dropped stuffed animal as you walk to your rental apartment. Like the Minaal, the Tom Bihn bags have a bit of a cult following, and the appeal is that they look more like everyday bags. And like the Minaal, the quality of the Tom Bihn products is immediately obvious. Beefy zippers, durable but flexible fabrics and, of course, color options. Now unlike the Minaal, the Tom Bihn Aeronaut 45 was super easy to pack. One deep main pocket (with compression straps) and two side pockets were great for organizing clothes, shoes and toiletries, and everything fit without a squeeze. Unfortunately, the two thin exterior pockets and one mesh pocket in the lid were the only options for anything like a laptop, tablet, chargers, documents, etc. Of course, with the cavernous main pocket, you could easily lay a laptop on top or below your clothes and use stuff sacks to organize the other miscellaneous. But my main problem with the Aeronaut 45 is the "gym bag" form factor. It makes sense to me as a suitcase/duffel, but it doesn't quite look right as a backpack. And honestly, that's the same reason I didn't order one of the highly regarded Tortuga travel backpacks that a lot of people swear by. They're just not something I think I'd enjoy carrying. Add to that the lack of a padded hipbelt (a narrow webbing one is available as an add on), and I think I would just as soon opt for the simplicity of the Patagonia MLC I've had for years over the Aeronaut 45. The Minaal technically has a 35L capacity, but all bag makers are quick to point out that everyone measures differently, and the most important metric is whether it will fit into the overhead bin (or the metal frame by the gate they use to make sure your bag can fit). When I did a test pack into the Minaal, I had to go through a few rounds of thinning to get everything to fit. In the end, I was happy with the things I got rid of. They were redundant or fell into the “just in case” category. I've found that sometimes it's better to be a MacGyver who can find solutions on the fly than a BoyScout who's always prepared. 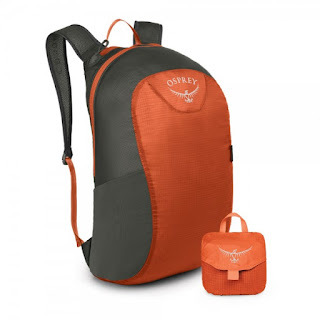 That made me wonder how everything might fit into another small, sleek bag, like the Osprey Porter 30 (30L). The best part of the Porter 30 is the clam shell opening that reveals a vertical-sided packing area that really holds its shape. This is a compartment you immediately know how to fit your cubes into and could envision using as a dresser in a hotel room, tent or camper. Even any miscellaneous items you might hastily toss in beside your cubes would be well contained. Close second is the well organized and easily accessible “office pocket.” I’ve seen this design, referred to as a “Jansport” pocket, a thin outer zip with a variety of mesh pockets and pencil holders recalling the school backpacks we probably all strapped on before homework became so burdensome that even the youngest kids now need to bring a rolling suitcase to school to avoid back issues. On the Porter 30, the office pocket does indeed have a slot for a small laptop (all you’d really want to carry, especially since the position of the sleeve away from your back is not optimal for weight distribution), a zippered area for a tablet, and lots of spots for travel docs, pens, pencils, notepads, a hard drive plus expandability for that three day old sandwich with just a hint of slimy turkey from the “Fresh Case” at the Terminal E newsstand. And any of that last minute overflow is all nicely contained by the side “wings” connected by compression straps that maintain a sleek look to the bag. Plus there are also two more easy access exterior pockets, one vertical on the outside of the office pocket and one on the top of the pack expanding into the main packing area. The test packing? Successful! Everything fits, but just barely. Not a lot of room for that Icelandic wool sweater (or tiny Icelandic horse) we may be tempted to pick up on the way. And Even MacGyver needs a few gum wrappers, the crystal from his watch and the head of a match to do his magic. Okay, so stick with me here. The Porter 46 is like the Porter 30 but, get this, bigger. The only other difference I can see is the addition of two internal pockets, one mesh and one solid, that run along either side of the inside of the packing area. Actually, a pretty nice addition. And surprise, my packing list fits into the Porter 46 a lot easier than it fits into the Porter 30, with some wiggle room for extras. In addition, as a result of the extra capacity, the office pocket lays much flatter on top of the packed contents instead of bulging like it did on the 30, allowing the 46 to be compressed more fully with the wing straps. When you're done, it actually ends up very similar in size to the Porter 30. The Porter 46 is just easier to pack, and with the "wings" wrapping farther around the bag, is a little more protected and sleek, in much the same footprint of the 30. Plus, we'd have that flexibility of not having to wear our bulky items on the plane or to smuggle a few kilos of French cheese along with us. Of course, as you add more inside the bag, the weight is bound to go up. One might start to wonder if the shoulder straps and hipbelt are up to the task. Fortunately, the Osprey has a cousin with a somewhat more established backpacking pedigree to consider. It would seem that in order to make up for the added weight of a beefier hipbelt and a more substantial frame, the rest of the Farpoint 40 has been stripped down. While the packing compartment attempts to hold its shape, it’s a wet noodle compared to the structured wings of the Porters that not only hold up the sides but wrap subtlety around the top and bottom to maintain the bag’s shape. 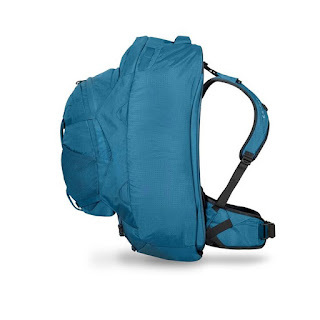 The Farpoint does add internal compression straps for holding packing cubes in place, a mesh zipper pocket on the inside of the top flap and comes in SM/M and M/L sizes to accommodate different torso lengths. Again, no surprises with the packing test. My list fit into the Farpoint 40 more easily than it fit into the Porter 30 but not as easily as into the Porter 46. Shocker, I know. I think we could probably make the Farpoint 40 work, but might end up bulging the office pocket so much that it would be hard to close with a laptop in it. And speaking of the office pocket, it’s been stripped down from the Jansport set up I’ve counted on since I was a boy to a simple laptop sleeve and one mesh zip pocket. Wheremi gonna put my Pee Chee folders and 8 color click pen, y’all? Okay, admittedly, the Farpoint 55 looks like a Farpoint 40 pregnant with a 15L love child, but the benefit is that this little bundle of joy can be birthed in the form of a detachable daypack and the amniotic fluid of your belongings… okay, I'm gonna abandon this metaphor at this point, but I do like the idea of being able to easily take our most valuable items - laptop, tablet, travel docs - with us anytime we're away from the bags. Of course, you can just as easily be mugged on the street or leave the bag behind at an Amsterdam cafe after two hits of “whatever he's having,” but at least you have a little more control than an unattended bag in a car or hotel room. The first thing I did when I pulled the Farpoint 55 out of the box was zip open the office pocket on the day pack. Cue sad trombone sound. It was the exact same as on the Farpoint 40, a laptop sleeve and a single zippered mesh pocket. Maybe I’m putting too much emphasis on this little bit of organization, but for me, knowing exactly where to find a pen or chapstick or a spare battery or a stamp or our contact cards or a passport just adds a lot to my sense of order while traveling, and that office pocket on the two Porter packs sure had scratched that itch. Add to that the fact that the Farpoint 55 measures a full 5” longer than the Farpoint 40 (3” longer than the Porter 46 which is the exact dimensions theoretically allowed as a carry on), and the Farpoint 55 was seeming like a dead end. In addition, while Googling reviews of the Osprey packs, I found that a few of them (like the Porter) have a system that allows for the attachment of the Daylite 16L daypack. Between that option or an ultralight, stowable day pack, finding a solution to bring some valuables along wouldn't be a challenge. So after zipping an unzipping every pocket and test packing these seven bags, my favorite is pretty clearly the Porter 46. 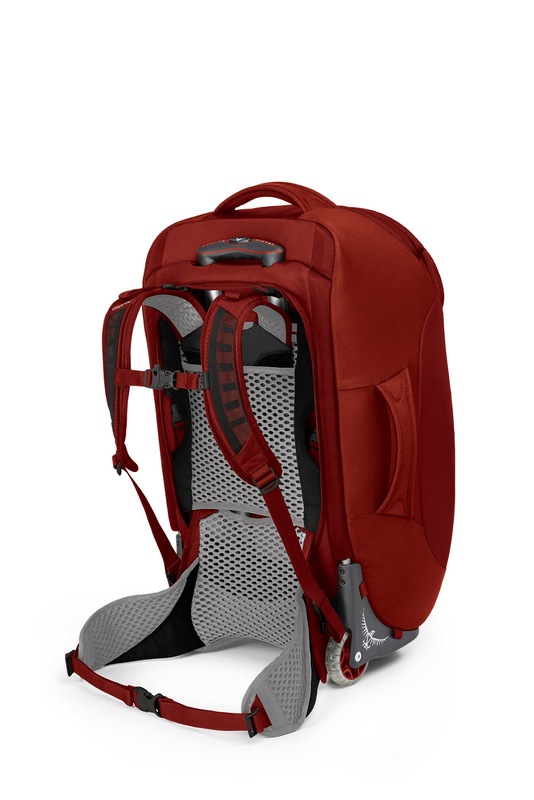 It's easy to pack, has lots of organizational options inside and out, is relatively sleek (but has room to expand), has a good suspension with a hip belt and is made by a trusted manufacturer who stands behind their products. While the others will get boxed up and returned, the Osprey Porter 46 is staying with me (Ann's decision still to come...). And after all that research, I was pretty excited to learn that the Porter 46 actually has a wheeled cousin, the Osprey Sojourn 45L/22'. The design is pretty much the same with the addition of wheels and a telescoping handle, and capacity would be perfect for the kids to share and still be within carry on requirements. While it retains the backpack straps which give us the option of carrying it with me as the meat in a travel pack sandwich if necessary, most of the time, we'd strap the two car seats to it and use it as a cart, leaving at least three of our hands free to try to help mimes out of imaginary boxes on the streets of Paris. I started out by writing that the first challenge was deciding how you wanted to travel. While we could certainly get by with less, three of these carry on sized bags for four people for 10 weeks in fall in Europe ranging from camping to pensions to trains seems pretty reasonable to me. We'll likely start packing in them for our various short adventures through the Spring and Summer and report bag as we see how well they fit our needs.